It’s World Book Day today and there’s been a lot of bookish fun happening on Twitter and FB to celebrate. I’ve had some great booky conversations; I’ve also been to Cardiff libraries, in particular, Roath library, in order to find a copy of The Invention of Wings by Sue Monk Kidd – because the copy I have is missing some 50 pages – or rather, instead of the 50 pages I was expecting, it had duplicated 50 pages from earlier in the book instead. I’m about to go and read those missing 50 pages now but before I do, I thought I’d share this WBD #shelfie. These are my ‘Arthur Ransome’ shelves: all of his books in Cape hardback and audiocassette, books about his life, books and locations, and all the other books on the sea, sailing and pirates that his books set me off in search of once I’d finished reading and re-reading all of his Swallows and Amazons series. I started reading his books when I was nine and every so often, I still go back and re-read one now I’m old enough to be an Aged Parent and I still find it hard to resist a book set in, on or around the sea or one about pirates or sailing. 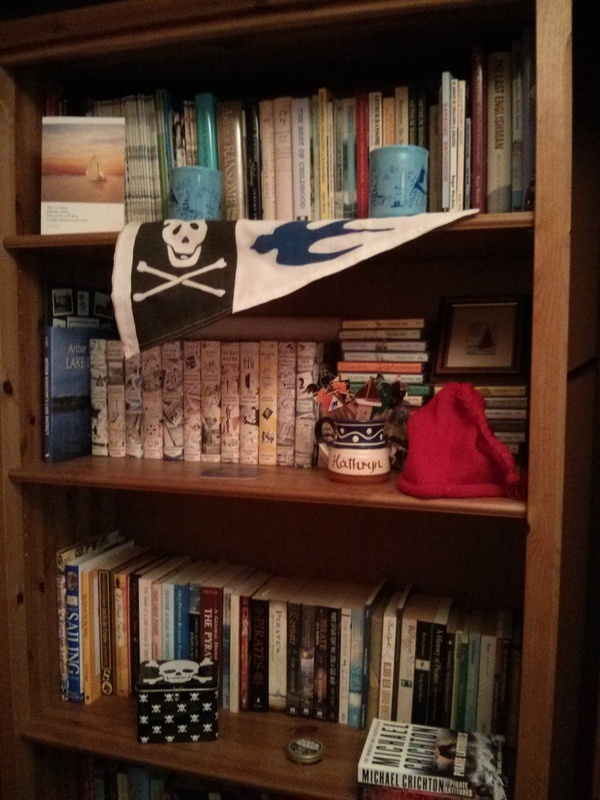 Kathryn – your shelfie could have been of my own Ransome shelves! A life long fan (I’m now 60) I have read them on and off since discovery when I was around 9 or 10. In recent years I have read them all and appreciate some more than I used to. Winter Holiday was always my favourite (a view shared with Hugh Brogan – I met him when I was a mature student at Essex University where he still lectures.) I’m fortunate to live where Secret Water and We Didn’t Me To Go To Sea are set, and my reading of the second one has made me appreciate it more than when I was young! Mike – 3m cheers! Thanks so much for visiting the Nut Press. It’s great to meet another lifelong Ransome reader! And chatting about Ransome and his books to Hugh Brogan must have been fascinating. I’m very fond of Winter Holiday as well, despite there being too little Captain Nancy Blackett in it, but another favourite was Peter Duck and I loved Secret Water. It must be wonderful to live near some of the locations that inspired Ransome’s books. I’ve sailed on Nancy Blackett from her home port and been sailing on the Broads. I’ve not made it to Secret Water yet. But I will. Envious that you’ve sailed on the NB, I’ve never sailed in my life – in childhood went on family holidays on the Norfolk Broads but only on cabin cruisers (Margoletta style but not in behaviour!) Everything I know about boats and sailing comes from reading AR! Well, I think I’m a better sailor in my head than I actually am on water, Mike! And isn’t that the great thing about Ransome’s books? That you don’t/didn’t need to camp, sail or explore in real life. All you had to do if you wanted to go on an adventure was to open the page and you’d be right there in one.